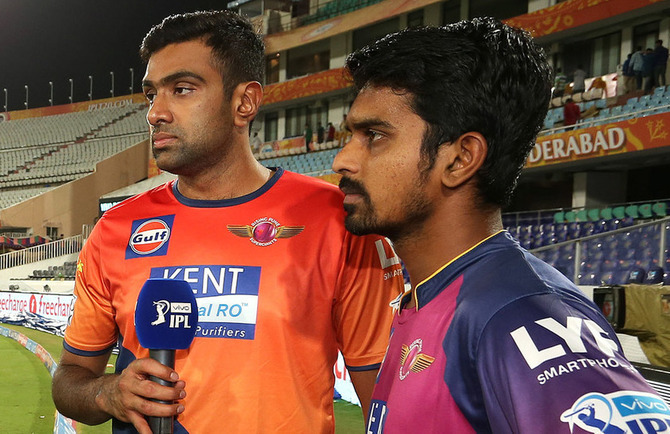 IMAGE: Rising Pune Supergiants spinners Ravichandran Ashwin, left, and Murugan Ashwin. Photograph: IPLT20.com. It is a treat to watch them bowl in tandem. Ironically, Rising Pune Supergiants spinners Ravichandran Ashwin and Murugan Ashwin also share the same last name. While off-spinner Ravichandran has emerged as India’s lead spinner in the last couple of years, Murugan is the talk of Season 9 of Indian Premier League because of the amount of turn he generates with his leg-spinners as well as googly. Catch the Chennai-based spinners in conversation with IPLT20.com. R Ashwin: He is a junior from my college. When I finished, he joined my college. We both come from the same college (SSN College in Chennai). That is the only connect that we share. We have never played cricket together. Apart from that we played for Tamil Nadu and this year he played under me in the Vijay Hazare Trophy. That is as far as how we go. I first saw him in 2012 when he made his debut in Cuttack. He didn’t get to bowl in that game. After that game, I left for the India-England series and he played the next game for Tamil Nadu. That was his first bowling stint for Tamil Nadu. M Ashwin: I think Ashwin just summed up everything in that answer. We have never played together and this is the first year that we are playing together, as he mentioned in the Vijay Hazare tournament and the IPL. It is a good experience to play with him. M Ashwin: I was a net bowler last year for the Chennai Super Kings and that stint was a great experience for me. I got to bowl to international players and got a hang of how batsmen play the game in the big stage. It was a good exposure for me and I am implementing certain ideas that I had in my mind during that time in this IPL. R Ashwin: It is very difficult to spot bowlers, but in front of my eyes he looked like someone who had got good revolutions on the ball. He spins the ball a mile both inwards and outwards. That is a trait that is inborn and you have to look for such traits. I always thought he was a good bowler; just that he needs to keep ironing out a lot of issues like any other spinner will have to do. At the Chennai Super Kings nets, he bowled to all the batsmen and all of them really struggled against him. They couldn’t pick his googly and couldn’t hit him out for a single six. R Ashwin: It could have been that I handed him his First-class cap in 2012. VB Chandrasekhar was the coach then and we both thought that he is a very good prospect and we made him debut on a wicket that was actually seaming around. We played two spinners and three fast bowlers. But we both thought he was a fine talent. Different people think differently but some talents go hidden away because of their own perceptions. M Ashwin: I remember the day when he handed over the cap to me. Lakshmipathy Balaji was the captain for that game but Ashwin was the one who gave me my First-class cap. R Ashwin: I keep observing Murugan, the way he loads the ball and I try and ask him a few questions. Obviously we try and exchange notes but I don’t think he has asked me how to bowl an off-spin yet (laughs). He has got a good googly so I don’t think the necessity arises to ask me. I keep observing him and I want to learn from him. I have gone out bowling my leg-spin a lot and I thought I should be using it in this IPL. I don’t know when but maybe the time will come when I will use it in the IPL. I have a pretty high-arm action. He has got a pretty straight arm action for a leg-spinner as well. There could be something similar on those lines so I am trying to catch up on what he is doing. M Ashwin: For me the googly comes very naturally because I am an open-chested bowler. It is something that I have had since my childhood. I have never really worked on it. He is a very experienced bowler and I have learnt a lot from him. He has given me certain ideas on how to bowl on certain wickets and what not to do. These are little things that he gives me and keeps telling me when we are bowling together. R Ashwin: That is something to note. I think spinners can be open-chested and bowlers are allowed to be open-chested, not just in-swing bowlers. There is an important note in there. It doesn’t matter how he is going to go or what he is going to do but spinners can be open-chested. There is a message there. He has all the tools of a spinner. The most important thing for a spinner in the modern era is to spin the ball. Most of the spinners don’t do it at this time and age and I don’t blame them for it because of the format that they play in. He spins the ball and he gives it a good rip which is a huge positive. A spinner is not someone who comes out of anywhere and grows and becomes big. It is an ongoing process and I am sure getting hit in this format, taking wickets and learning the skills will be important for him. It is a great platform for him and he has done pretty well. He has taken wickets and got hit as well but it is all part of the learning curve. M Ashwin: It is a very big tournament for me and I am enjoying each moment of it. I would like to make the most of it. It is an opportunity that every cricketer would like to have. It is one thing that has come my way and I would like to make the most of it. It is great to play under MS Dhoni. He is one of the most successful captains for India and he is a very calm person. He handles me really well. It is a very good experience to be playing under him. R Ashwin: Generally, as a group, the people from Tamil Nadu are known for a lot of humour. It is just that we find ourselves a bit out of place when there is a language difference so we are not entirely able to bring our humour there. But when we are speaking amongst ourselves, there is a lot of humour around. Mostly around the breakfast table there is a lot of laughter. I feel people could feel we are rude but we are enjoying ourselves out here. M Ashwin: Since we are from the same state and we speak the same language, we discuss a lot of Tamil movies and jokes. That is something that we both discuss over the breakfast table. M Ashwin: I have learnt Hindi from my school days. Hindi was my second language. I can understand Hindi, but I am not so fluent in speaking it. We speak in Tamil. R Ashwin: I think he understands a lot of Hindi and he speaks pretty okay as well, although I am not too sure about his Hindi speaking skills. I haven’t spoken a lot with him in Hindi. That is the last thing I want to do. I speak in Hindi through the year and when I find someone who can speak the same language, I better stick to the same language. We love Tamil, we do.